Two years ago I found this little decorative bird cage at a thrift store. I bought it because, at the time, my sister and I were vendors at a craft mall. In my mind, little old ladies would jump at a chance to purchase a decorative bird cage. I was wrong. This little bird cage sat in our booth until my sister and I stopped selling at the craft mall a little over a year ago. 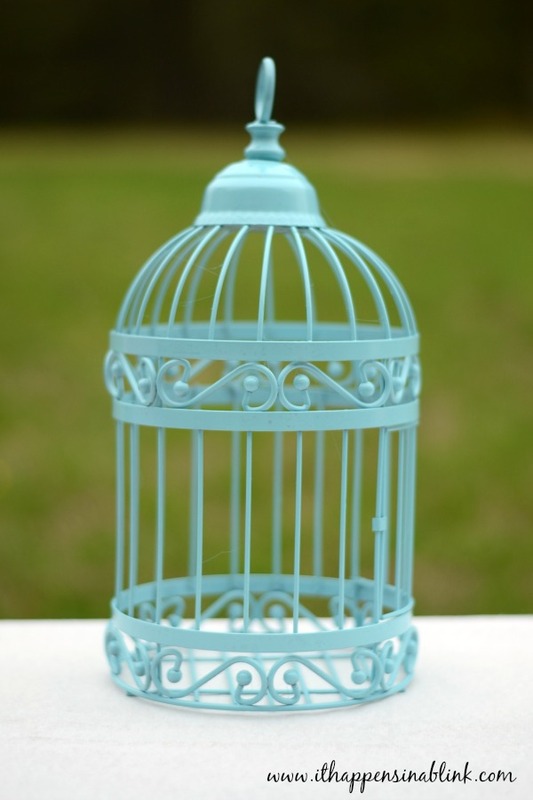 Even though I’ve gotten rid of most of the items that had not sold, I couldn’t part with this bird cage. I don’t know why. I guess I liked it. Call me a little old lady. In it’s current state, it needed desperate help. I had a few friends recommend that I spray paint it. However, I am a spray painting nightmare. My husband can’t figure out how someone who does as many crafts as I do is incapable of spray painting. 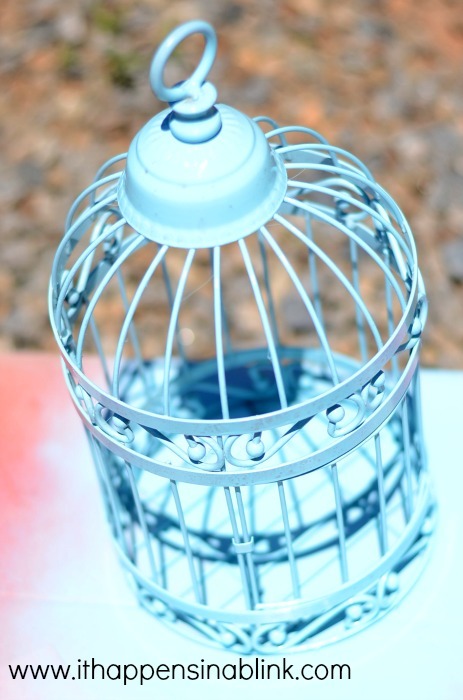 I really wanted to spruce up this bird cage, though, so I determined that it would be my first spray painting success. I started with a cardboard in the driveway on a sunny day. I chose a pretty turquoise color and went to work. 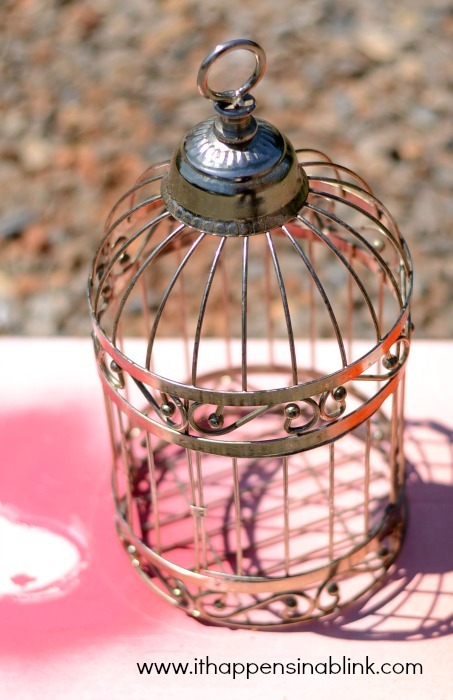 After two coats of spray paint, I’m excited to report that I now have an upcycled birdcage! I managed to paint this without any unsightly drips or uneven spots. I’m hanging on to this for photo props and spring decor. Are you a successful spray painter? This is so beautiful! You did a great job on it and the color is amazing! Thanks! I am happy with the improvement! I love the color! I spray painted for the first time last year and it wasn’t nearly as scary as I thought it would be! 🙂 So much easier then using a paint brush! Love the color! Looks so nice. 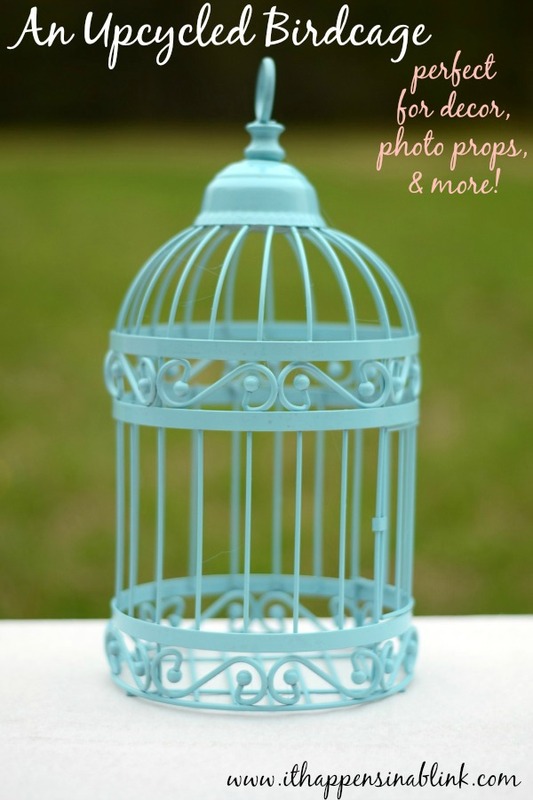 I haven’t made any decor with birdcages and I love it! So I’ll have to try one! It’s great to find one at a thrift store!